Aren't they beautiful?! We each had to try something new with this swap and then also send one of our tried-and-true soaps. Gordan’s new soap that she tried was the activated charcoal and carrot juice soap (which is the one in the middle). She also tried a new technique with this soap, the faux-funnel pour. You can check out her post about this soap on her blog here. She also sent a beer soap (the one on the left), which is her tried-and-true soap. I'm really looking forward to trying this soap, because I've heard that the sugar in the beer really adds to the lather. This soap also contains cocoa butter, oatmeal and honey...nice~! 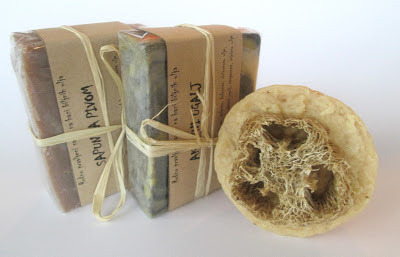 The third soap was the loofah soap, which she has embedded into some HP soap...it smells so good too! I'm really looking forward to trying all of your beautiful soaps with these new ingredients I've never tried before. Thank you Gordana, I feel so lucky! Now, getting back to this essential oil soap. It’s been a long time since I’ve made a pure essential oil soap, so I thought I would try a blend of Palmarosa and Geranium essential oils. I really like this blend; it’s a soft, clean floral with just a touch of green. The palmarosa reminds me of lemons and roses, and the geranium adds a light, earthy note to the blend. I used 2 parts Palmarosa essential oil to 1 part Geranium essential oil. I also wanted to add some interest to the top of the soaps. I had seen a picture of some soap on Pinterest with similar tops, and I wanted to see if I could replicate the tops by blending some mica colors. Thanks for reading and have a great weekend everybody! The top is so pretty! Sadly I have only one mica at the moment so I can´t try that technique. 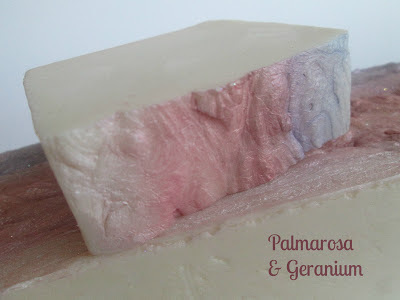 I haven´t either smelled palmarosa ever, so I just have to imagine how your soap smells like. Thanks Marika! Palmarosa is nice...a faint rose scent but not overpowering at all. Rose, lemon and tea is how I would describe it. This is really great! 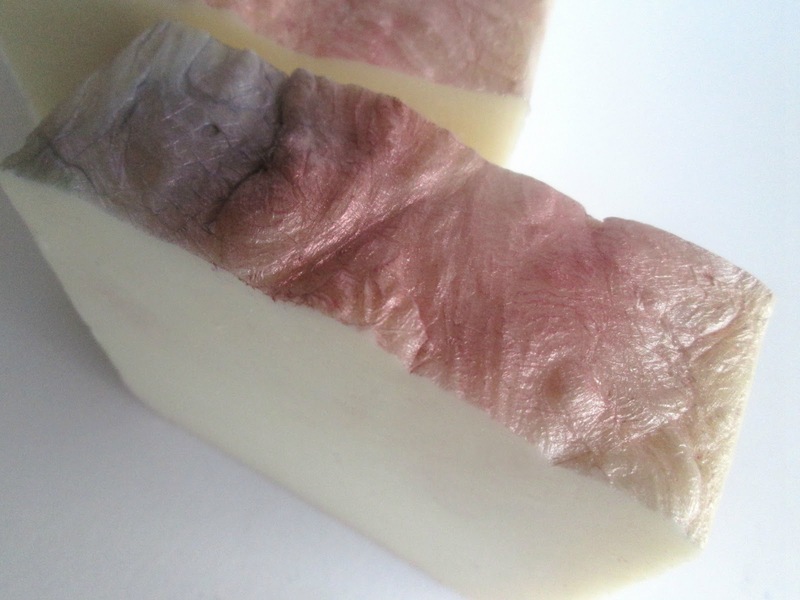 I like this HP soap top coloring, it really gives additional value. I am glad that you like my soaps and hope that you will really enjoy! I love the soaps Gordana, thank you again! I realized after that I should have taken a picture of the soap unwrapped, but I was so taken with your natural packaging, so pretty! 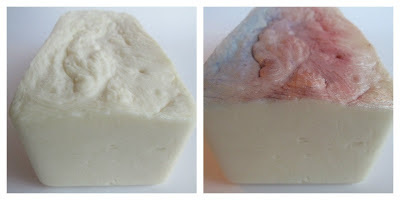 Your soap is so delicate, Cee, and the EO blends you added are so lovely! I haven't tried other blends in soap than essential oils, I love them, it's true they don't last so much but it's worth using them for their properties for skin! Wish you a warm weekend( here it's snowing!)! I need to mention here that soaps you sent me are so nice smelling, they really make me think that all I have read about e.o. fading is false. Considering one of them being old over 6 months, I think the scent perfectly holds. Hey Cee,nice to read you again! I like how you did the soap top,but I must admit I like more the smooth texture of your HP soap! I haven't tried it yet (never have enough time in the evening for such a long procedure),but as smooth as yours is,I think I've never seen before! Are you sure it was HP? (ha,ha,just kidding,of course) What's the catch? Oh Cee,you owe us a pics of your 'swirly' soap cut! Hi,hi, I haven't forgotten that one! Hi Maja! I've been consumed with work this week, so it doesn't leave me much soaping time :( Yes, that is definitely HP...ha ha! It only takes one hour for me to cook it, and I have a couple of tricks for making it smoother ;) Oh, you have a good memory! The swirly soaps are still stuck in the mold, it's a rather temperamental mold, so I'm hoping I will be able to pop them out and cut them this week sometime! Your Palmarosa and Geranium soap is gorgeous, Cee Gee! I love the blended mica layers on top. And Gordana's soaps are so pretty - the packaging looks fabulous! So beautiful, I love it Cee! I am a chemical engineer who has been live Bangladesh and used Essential Oil Soap for many years. It’s protecting our skin. Its quality is a very nice. But its price rate is very cheap. Not only is it perfectly suited for your own skin, it makes for a wonderful gift as well. Thanks for this superb post on pure Natural oils, most useful in Skin care, Paramedical and medicinal matter and so on. May I share your post?